Palustrine emergent wetlands on the Monolith Ranch. Ducks Unlimited, together with 16 other organizations, established the Pathfinder Wetlands Partnership. The partnership was awarded Wyoming’s second only standard North American Wetlands Conservation Act (NAWCA) grant. 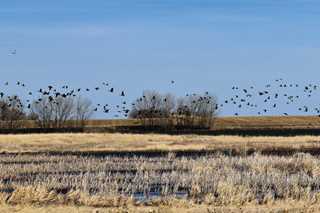 The $1 million grant, plus $4.5 million in match from partners, will restore, enhance and protect 3,300 acres of wetlands in southeast Wyoming and western Nebraska. The North Platte River guided pioneers on their path to the west. To honor the river and its history of providing abundant resources to humans and wildlife, the Pathfinder Partnership is working to conserve wetlands and other habitats important to non-breeding migratory bird populations in the North Platte River basin. Several projects included in the NAWCA grant proposal are on public lands that offer access to hunting and other outdoor recreation. One project, in partnership with the City of Laramie, has a goal of improving recreation opportunities, including wildlife viewing, fishing and hunting. Restoration will focus on wetlands and water control structures to provide habitat for migrating birds. DU and the Rocky Mountain Elk Foundation will place conservation easements on two properties that will protect the land’s wildlife habitat in perpetuity. Both properties are near other protected areas owned by U.S. Forest Service, Wyoming Game and Fish Department and the Wyoming State Trust. This makes these properties critical puzzle pieces in connecting riverine-associated wetlands and uplands in the Little Laramie River corridor.